There are so many opportunities out there to print a variety of jobs, both on flexible as well as rigid substrates. The trouble is you may not have the budget for two dedicated printers, or enough floor space to accommodate both. What could be better than a truly versatile all-in-one hybrid printer that can turn into a fully automatic flatbed in less than 5 minutes? If you know your way around the grand format printing industry, you are probably familiar with the main three types of printers: Roll-to-roll, Flatbed and Hybrid. While the first two types are dedicated to their native type of printing, either on flexible or rigid substrates, hybrid printers can do both, switching from roll-to-roll printing mode to flatbed and back. Print providers need to choose which of the three types to own. Their decision is based on weighing criteria such as speed, quality, job types in their market and total printer utilization time, against the cost of the printer, expected ROI, available floor space and more. When you watch a flatbed or hybrid printer during a typical workday, you will notice that the machine is actually being utilized only 50-60% of the time. The rest of the time is taken up by the loading and unloading of the media. You have paid hundreds of thousands of dollars for this machinery and you only use it about 50% of the time. This is outrageous. 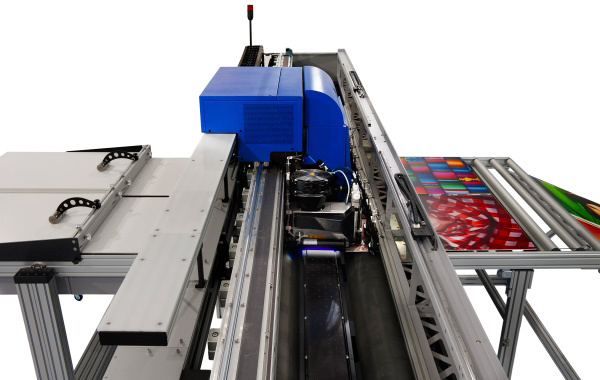 To resolve this situation, Matan’s R&D team took upon themselves the challenge to develop an affordable automatic flatbed mechanism that would allow the printer to be utilized at its maximum, eliminating as much “wasted” time as possible. The result is the EFI Matan 8Q Flatbed+ with automatic loading system, a real hybrid printer that offers the best of both worlds. The new automatic flatbed has a magazine type of loader, where up to 20 boards can be stacked. 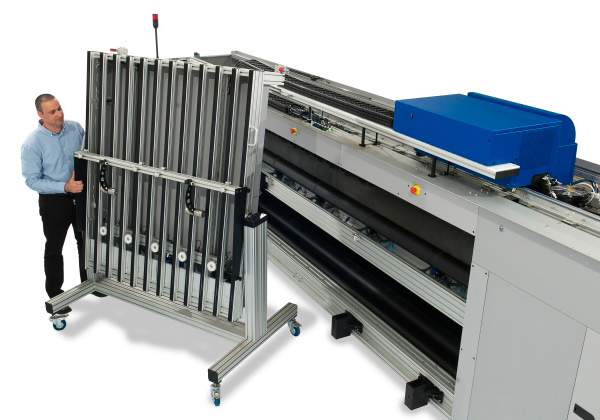 The automatic mechanism pulls the boards from the magazine and automatically feeds each board to the printer. The entire process is controlled by a click of the mouse, so there is no need for manual feeding and collecting. After printing, the boards are automatically unloaded and collected. The operator can load additional media while the printer continues to print. There is no need to stop the printer to load more boards. This means that the printer is working approximately 95% of the time and there is no “dead” time spent on loading and unloading. 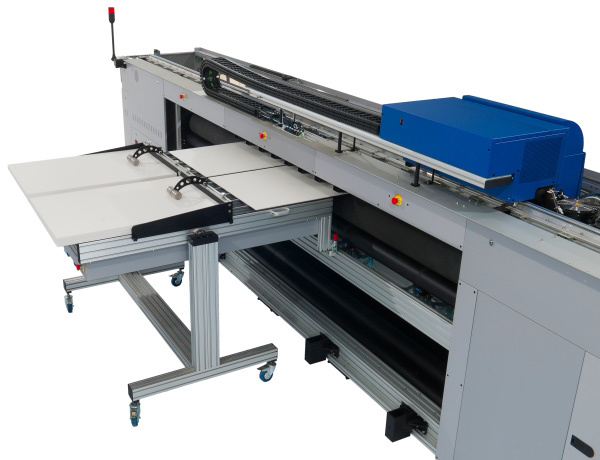 The EFI Matan 8Q Flatbed+ optional set of flatbed tables are available in four sizes, so that every owner can choose the right size for their needs. Moreover, this is the largest hybrid flatbed in the market, with a full format of 330 x 250 cm (130” x 98”)! And the neatest part is that the beds are completely collapsible. They fold up very easily and quickly and can be stored upright, taking up very little storage space. It takes just under 5 minutes to switch from roll-to-roll into flatbed and back. How’s that for versatility? And when we say versatility we mean it. 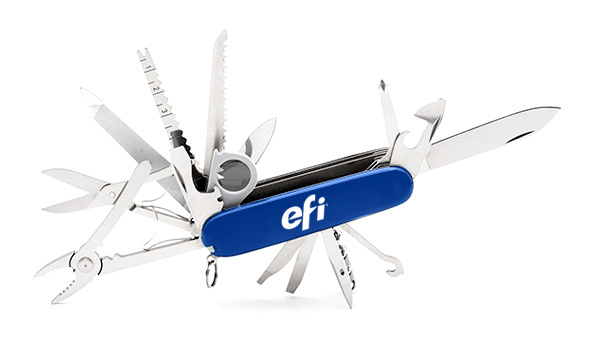 The EFI Matan 8Q printer can print literally on any media, rigids – including foam board, polycarbonate, polywood, glass, Dbond, corrugate and more or flexible media – PVC banner, SAV, papers fabrics, carpets and the list goes on and on. Multiple boards can be printed simultaneously along the width of the printer and the front-end software makes it very easy to print different files on each board. 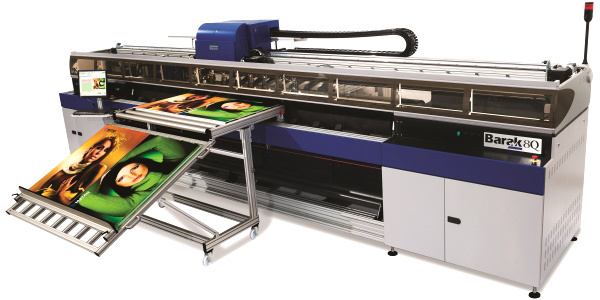 The EFI Matan 8Q versatile flatbed increases production throughput and maximizes utilization of overall machine print time, thus delivering fast ROI and lowering total cost of ownership.